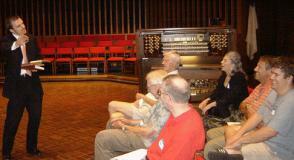 Steven Ball makes a humorous point during his lecture/demonstration about the Plymouth Congregational Church Casavant. Brian Fowler (center) suggests some stops for MaryAnn Balduf as Brian Sweetman, Leonard Feerick and Trevor Dodd pay rapt attention to the process. Steven Ball plays delicately as Carl Balduf listens approvingly. 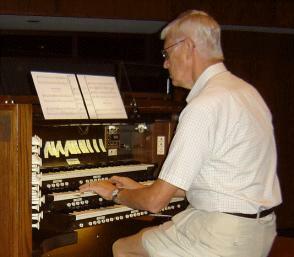 Brian Sweetman takes his turn at the Casavant at Plymouth Congregational Church. Jim Wilkes investigates the tonal qualities of the Plymouth Congregational Church Casavant. 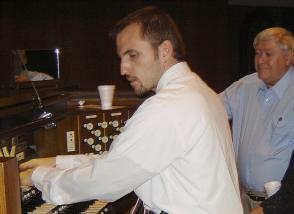 Trevor and Gary Dodd (r) discuss niceties of Casavant workmanship. 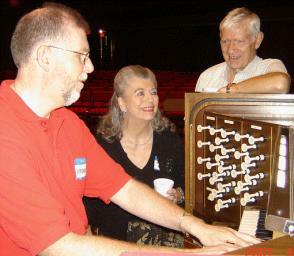 Chapter President Carl Balduf called the September 22, 2007 meeting of the Michigan Chapter of the Organ Historical Society to order at 9:45 a.m. at Plymouth Congregational Church, Lansing, Michigan. Present were Carl Balduf, MaryAnn Balduf, Steven Ball, Trevor Dodd, Gary Dodd, Leonard Feerick, Brian Sweetman and James Wilkes. Balduf began the meeting by thanking Steven Ball for arranging the day's meetings at Plymouth Congregational Church and St. Mary Cathedral. The minutes of the April 21, 2007 meeting were then approved as corrected, changing the date in the first line from March 10, 2007 to April 21, 2007. In the absence of treasurer Terry Jankowski, Balduf presented the Treasurer's Report which was accepted as read. The Report is posted below. Balduf said that the Chapter Bylaws have been completed in draft and explained the ratification process. "In November, the draft will be posted on the chapter Website and mailed to those active members without email. Ratification will be by the return of a postcard ballot mailed to the active members of record on October 31, 2007. For the purposes of ratification, an active member is one who is on the [previously posted] list ... or whose dues have been received by the Membership Chairman by October 31, 2007." A motion was made and seconded that the ratification process be approved. The motion carried. Balduf asked for ratification of a change of the annual dues period from January through December to September through August of the following year. This makes the membership year correspond with the Chapter program year. A motion to that effect was made and seconded. The motion carried. In a related issue, Balduf announced the issuance of membership cards to all active members whose dues were paid on or after the October 28, 2006 meeting. All present agreed that the cards have been received. The issuance of membership cards was met with general approval. Balduf then announced the appointment of member Diane Hiltner as Membership Chairman, with duties of receiving dues and issuing membership cards. Dues can be sent to her at the following address. A discussion than followed regarding the possibility of a Chapter excursion to the western side of the state, to explore many interesting and historic instruments in Grand Rapids and the surrounding area. No conclusions were reached but the idea was greeted with no small measure of enthusiasm. The Battle Creek area was also considered with interest. In response to a question from Steven Ball, Balduf affirmed that a Chapter mission can be that of identifying and submitting instruments worthy of an OHS Citation of Historical Merit. He then cited the Casavant, Opus 1200 at the Detroit Institute of Art, which we are currently evaluating for a Citation. 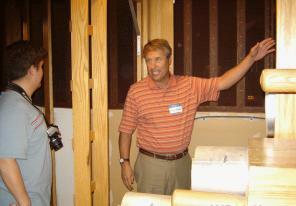 Ball said he also had an organ or two in mind in the western part of the state. Following these discussions, a motion for adjournment was made and seconded. The motion carried and the meeting was adjourned at 10:06 a.m. 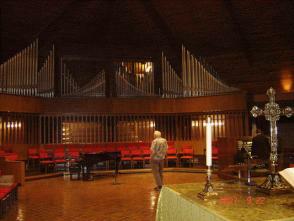 Following the meeting, Steven Ball (above left), Organist at Plymouth Congregational Church, gave an informative overview of the Church's 1975 Casavant and it's differentiation from earlier instruments. 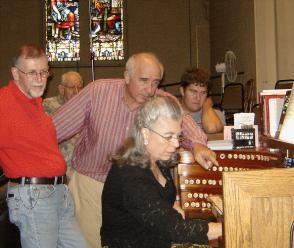 Following a demonstration by Steven, a 90-minute open console was enjoyed by players and listeners alike. 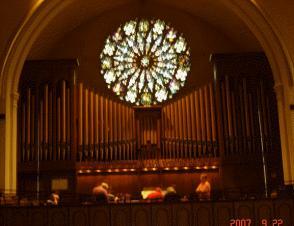 Following lunch at Clara's at the Railroad Depot in downtown Lansing, the group moved to The Cathedral of St. Mary (RC) and it's 1930 Casavant (1403), restored and enhanced by the Fowler Organ Company. Brian Fowler was graciously present to explain and demonstrate, via midi recording, the extraordinary tonal range of this highly romantic French/English sounding instrument.